A2 full colour posters litho printed full colour 1 side on 170gsm silk and available with 3 service levels. Delivery dates for each service level can be seen in the bar below. Colourful A2 posters are a great way to create eye catching, promotional material to promote events, or to market your business and its products. It can be very expensive to design and print posters, but by taking advantage of the posters on offer at quadrantprint.co.uk you can reduce the expense considerably, without having to sacrifice quality. You can easily upload your own artwork to the site to print your own designs, or you can take advantage of our professional artwork service that starts at a low £75 to produce attractive poster designs for you. The poster design process at quadrantprint.co.uk is simple, making it easy to create custom posters with just a few clicks. With prices starting at only £119, our A2 posters are very affordable, while larger orders reduces the cost to a few pence each. Even in this digital age, A2 posters are still among the most effective ways to promote your business or special events. Our posters are printed on 170gsm silk paper stock to ensure the highest quality result, and all orders are delivered free to U.K. mainland addresses. There is a choice of service levels that allow you to make express orders, which ensures that we will have your posters to you within three business days. There is also a next day delivery service available on A3 Posters for orders placed before 1pm if a faster turnaround is necessary. The large format of A2 posters is perfect for presenting clear images that will make your message clear. You can upload your own artwork in a variety of file formats, giving you complete control over the design of your posters. Because our modern printing technology allows us to create small, cost-effective print runs, it is also simple to make adjustments to your A2 posters to get them looking just right. We offer an A2 poster printing service that makes it easy for you to create your own custom, full colour posters. Our high quality posters are delivered free to all U.K. mainland addresses, with a choice of service levels that determines how quickly your posters are delivered. At quadrantprint.co.uk, we print our posters on 170gsm silk paper to offer the highest quality poster printing possible. We also make it simple to use your own artwork to create exactly the poster that you want. Posters are a great way to attract a lot of attention to your event, and our litho printing service makes it easy to produce small quantities of posters quickly and accurately, making it possible to order posters only as you need them. Our A2 poster printing service can produce print batches as small as 125 copies at a cost of less than £1 per poster. As the number of posters ordered increases, the cost per poster reduces to less than 15p per copy. While quadrantprint.co.uk offers a professional artwork design service that can create A2 posters from as little as £75, it is also possible to upload your own artwork to our A2 poster printing website in a variety of formats to print your own custom designs. 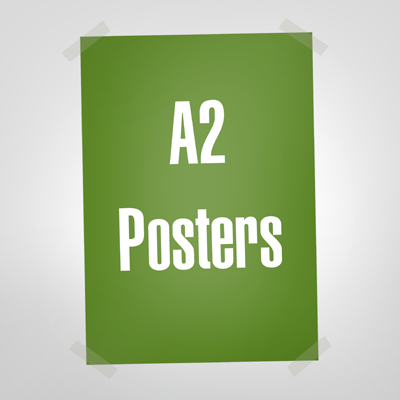 Creating your own full colour, customised posters is easy with our A2 poster printing service. It isn't necessary to have any specialised computer skills to start your poster printing project at quadrantprint.co.uk; you just need to click on the quantity and the service level that suits your budget and follow the simple steps. With 4, 2 or 1-day production options, the A2 poster printing service from quadrantprint.co.uk will get the perfect posters to you, right when you want them, at a price that you can easily afford.